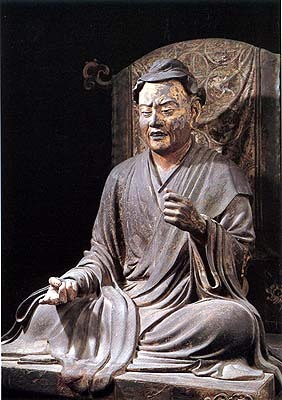 According to legend, Yuima was an Indian merchant who became converted to Buddhism. Although only a layman, he was revered as a powerful and eloquent orator. The statue was made in 1196, by Jokei according to Hisashi Mori, although a caption in Kidder's book assigns it to Kokei. The statue reflects the influence of Sung art in various technical details: the overhang of Yuima's sleeves onto the pedestal, the shape of the back screen, and a Chinese lion carved onto the pedestal (not shown in this photo). Although it is an imaginary portrait, the statue's realistic style is typical of Kamakura-period sculpture.